Avenida Revolución (Spanish for "Revolution Avenue") is the tourist center in Tijuana, Baja California, México. It is a main thoroughfare of the historic downtown of Tijuana, officially called the Zona Centro, which forms part of the Delegación Centro or Central Borough of Tijuana. It was the first paved road of the 20th century, an important center of economic development, and a tourist attraction notable for the visitors who crossed the border daily from San Diego, California. The city's most remarkable development was during the Prohibition period and after World War II, since it was considered a center of prohibited entertainment for inhabitants of the United States. During this time Caesar salad was invented at the restaurant of the Hotel Caesar, Caesar's. Currently, the street is the center of tourist activity. Avenida Revolución has experienced many changes, and is known as the business card of Tijuana, "The most visited city in the world". It was known for its famous cantinas including, "La Ballena", the largest bar in the world when it was open. The city was popular with American Navy sailors until the United States Navy prohibited sailors from visiting Tijuana. From 1989 to 1994 the Avenida's Baby Rock discothèque was the claimed to be #1 club in the world based on gross revenues, before becoming in 2012 the Onixeus. C. Hermenegildo Galeana Séptima (7ª, 7th) El Foro (former Jai Alai palace) and Caliente casino, SITT (BRT) bus stop "Jai Alai"
C. Francisco Madero / Blvd. Fundadores Torre de Agua Caliente monument; Street continues east-southeastward as Blvd. Agua Caliente. Plaza Santa Cecilia with papel picaco decorations. The long avenue is home to several distinct attractions, from cantinas and table dance bars to numerous dance clubs and art galleries. A popular tourist attraction is taking a picture with a zonkey, a donkey painted to look like a zebra, but only a few are left. At night, most of the shop keepers close as some night club and bars open. Businesses include some remaining handicraft and leather shops, pharmacies frequented by Americans in search of cheaper medicines, and a branch of the Sanborn's gift emporium and casual restaurant, a popular chain across Mexico. The shopping arcades lost many of their customers and tenants in the years after 2001 as tourism dropped, however the Pasaje Rodríguez has been repurposed as a design/cultural destination with businesses selling coffee, books, and artisan clothing and other products. El Foro, the former Jai Alai Palace, is now a concert venue. Caliente operates two casinos on the avenue. The Avenida was remodeled a few years back widening the sidewalks, adding bus rapid transit lanes and reducing lanes for car traffic. Wikimedia Commons has media related to Avenida Revolución. 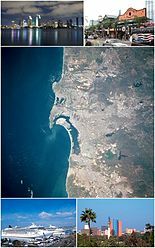 ^ "Official map website of the Tijuana City government". Archived from the original on 2016-07-03. Retrieved 2013-04-06. This page was last edited on 8 April 2019, at 10:08 (UTC).